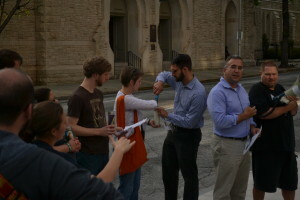 On April 27 at 7 p.m. about 50 people stood outside the Georgia State Capitol building to hold a vigil in Daniel Lucas’ honor. Two and a half hours later, Daniel Lucas was executed via lethal injection at the state prison in Jackson County. Lucas was convicted in 1998 for the murder of 11-year-old Bryan Moss, 15-year-old Kristin Moss and their father, Steven Moss. The three walked in on Lucas and an accomplice burglarizing the Moss family home on April 23, 1998. According to Reuters, a prosecutor during his sentencing described Lucas as “pure damn evil” and said “there is nothing in the world that could redeem him”. Eighteen years later, Murphy Davis, a member of the Open Door Community, an organization seeking to abolish the death penalty, led the vigil at city hall and stepped forward to share Lucas’ story. “It wasn’t always this way for Daniel,” she said. Lucas was born to an alcoholic father who beat both Daniel and his mother, who was addicted to various drugs throughout her life. Lucas’ mother introduced him to alcohol at the age of 7, and by 19, she said, he was addicted to nearly every amphetamine and narcotic substance. After his conviction, Lucas spent 18 years on death row in Jackson County Jail. Davis said he became a devout Buddhist, reading countless religious texts and engaging in written communication with spiritual leaders. According to the AJC, Lucas’ lawyers cited his faith in his clemency request and said he was described as a model inmate. 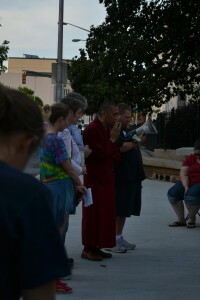 A Buddhist monk attended the vigil for Lucas and prayed in his honor. Dorinda Tatum, a member of Georgians for Alternatives to the Death Penalty (GFADP), who attended the vigil, said an alternative to the death penalty could give individuals a shot at reformation. Georgia State grad student Latrina Jackson said she’s been attending vigils for the past seven years and thinks the death penalty is an unfortunate part of Georgia’s culture. Multiple studies have proven that seeking the death penalty adds millions of dollars to prosecution costs and in some cases may be six times more expensive than life in prison. 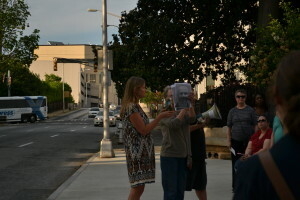 The crowd sang in front of the capitol, “Ain’t you got a right to the tree of life”, and called out the 64 names of people executed in Georgia since 1976, lighting a candle after every ten. A seventh candle was lit for Daniel Anthony Lucas.